Two magnetically backed calendar supports allow month-to-month transitions. Seven special date elevators highlight important dates. 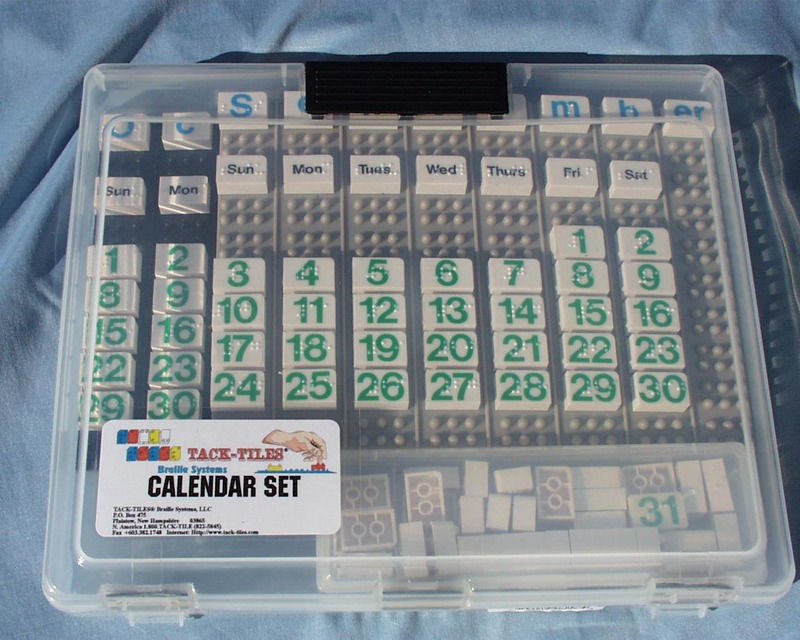 The TACK-TILES&REG; Braille Systems Calendar Kit is made usable by the sighted and the visually impaired. The magnetically backed support slates measure 9 and 5/8 inches by 7 and 3/16 inches (24.5 cm. by 18 cm.). These may be used on the plane of a desk or they may be hung on a perpendicular metal surface like a file cabinet. Two supports and all necessary parts are supplied so that two months may be displayed at a time allowing for learning in concept of month-to-month transitions and comparisons. The upper right hand corner of each tile is radiused for proper Braille orientation. Months begin dot 6, dot 6, Letter. Days are marked "Letter sign,"dot 6, and a one letter abbreviation, except "Sa," Su," Tu," and "Th." Each date reads, "number sign, number." Seven full cell TACK-TILES&REG; are included. When placed under one or a series of date tiles, that or those special dates protrude above the others. Click here to return to TACK-TILES&REG; Home page. Click here to return to New Products page.